As you pull into the car park of the Tha-Nam Restaurant you immediately step back in time to a less hurried era, long before mobile phones and computers. The restaurant is made from five very old wooden houses that have been arranged to fit in with some huge old fig trees, on the bank of the River Ping, itself lazily flowing by. You will probably be met, not by a uniformed ‘meeter and greeter’, but by an Australian Major Mitchell cockatoo saying “Sawasdee Kha”. Don’t worry, Major is not ferocious, and despite a beak that could take your finger off, the cockatoo is more likely to lie down and wait to be stroked! You walk past an art gallery and through one of the houses until you are riverside, standing in a rustic scene with split log benches and seats, placed beside a pond, with thick tropical foliage and the air-roots from the fig trees streaming down. If ambience is what you are looking for, this place has it. Hanging northern lanterns adorn the trees, the staff are all in ‘patoongs’ and traditional Lanna tops, there are woodcarvings everywhere, ethereal relaxing music comes gently from hidden speakers in the foliage. In the evenings, northern folk singers accompany the diners from 6.30-9 p.m. This is the ‘old’ Lanna revisited. 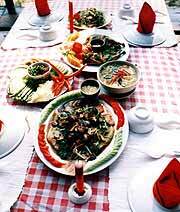 The menu is comprehensive with around 100 Thai cuisine items, beginning with appetizers (all under B. 100) including interesting offerings as cuttlefish cake and fried bamboo worms, as well as the more usual spring rolls and sun-dried beef, or even french-fries! Next page is entitled Taste of Asia, with many dishes being offered as small or large servings, with nothing over B. 190 and most around B. 100-150. This includes steamed or fried fish done in different styles. Local Food is the next section (B. 25-135) and includes Chiang Mai sausage, made by the owner’s mother-in-law to an original recipe. Other local items include the famous Hang Lay curry and hot and spicy bamboo shoot with pork spare ribs. Stir-fries follow, with all under B. 100 with many combinations not usually found in every restaurant. This includes stir-fried asparagus and mushroom, coconut tips with shrimps and spring cucumber tips with oyster sauce. A page of Thai soups and curries has small and large sizes on offer, with the small all under B. 100 and B. 150 being the most expensive for the larger serves. All the usual standards are here, the tom yums, gaend jued and tom kha dishes. Getting close to the end with some spicy salads (again all under B. 100), then vegetarian items under B. 75 and beverages, desserts and cocktails. We let Tha-Nam decide what we should try and they presented us with a wide selection of their dishes. If first impressions are important, the presentation of the food was superb. First up was the steamed tub-tim with Chinese soy sauce. A delightfully aromatic dish, with the fish falling apart with the slightest pressure from the spoon. This was Madame’s favourite, and I must admit I returned to it several times during our lunch. Next was the green curry (gaeng keow wan) which was, as its name suggests, a sweet green curry. Not too spicy - just very flavoursome. At the same time, I decided to try the spicy herb salad. This is ‘spicy’ but not overly so, and was a mixture of herbs and was very, very good. Probably my favourite. We had a long and relaxed lunch at Tha-Nam Restaurant. This is not the place for a quick bite on the way through to an elephant trekking afternoon. It is the place to enjoy the company of your family and friends over lunch or dinner. I would recommend this restaurant as a place to take overseas visitors. It has none of the ‘tourist’ commercialism, but all of the northern hospitality. It is also inexpensive, particularly when the location is taken into account. Tha-Nam Restaurant, 43/3 Moo 2, T. Phardad, Chiang Mai, telephone 053 282 988, mobile 01 884 3835, fax 053 275 125, email [email protected] chmai.loxinfo.co.th, www. kamponglodges.com. Secure off-street parking outside. Open 10 a.m. - 11 p.m. daily.